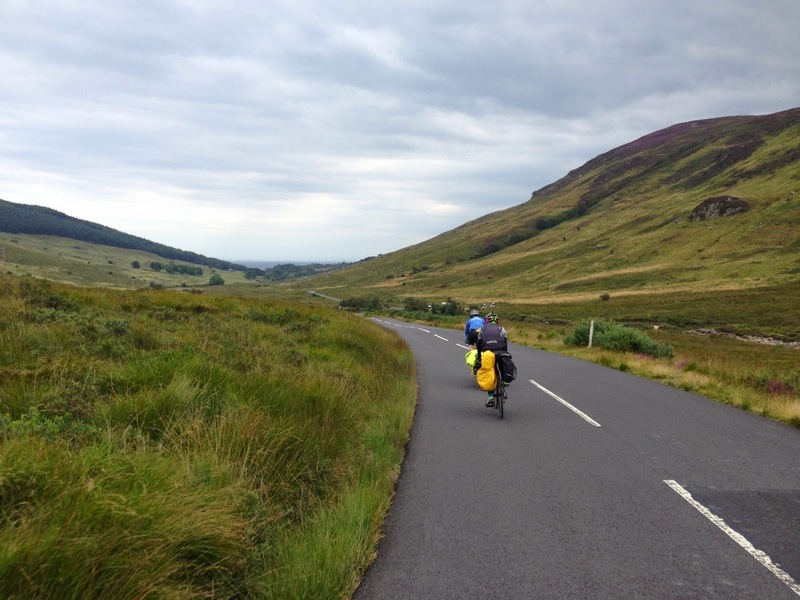 After a few weeks of planning we packed up the bikes and headed for Ardrossan heading for the Isle of Arran and then the Isle of Islay after that. There were 8 of us in the group, five adults and 3 young ones ranging from 13 to 4. The younger members of the group made sure they had a bar bag for a good supply of sweets that kept the group going throughout the trip! We hired 4 bob trailers from Cyclewise at Whinlatter and they were awesome! 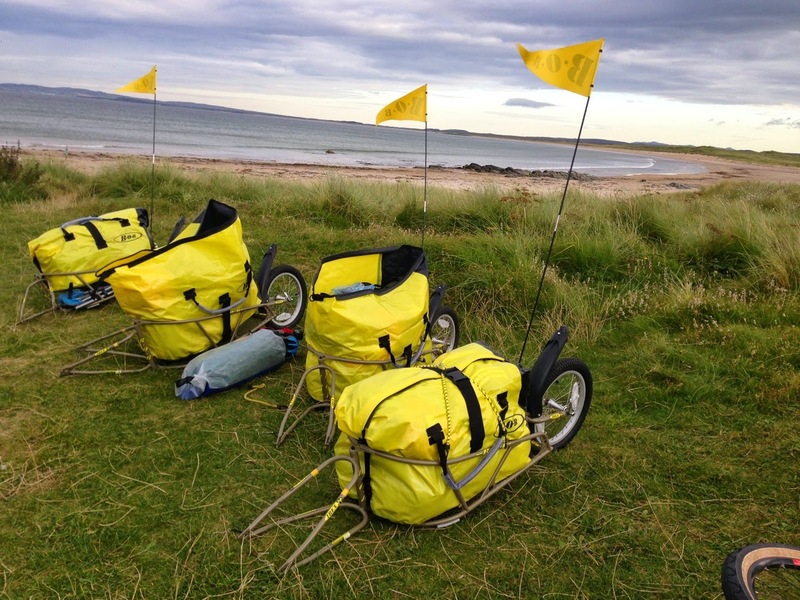 Along with a few panniers we were all good to go! The 4 year old travelled in the weehoo keeping the group entertained with songs and conversation throughout! We caught the 9.45am ferry from Ardrossan and headed for Brodick. We arrived at 10.40am and headed over 'The String' to have lunch at Blackwaterfoot sampling the delights of the Kinloch Hotel. The climb over The String was lovely, not too steep with fantastic views! The ride down to Blackwaterfoot went well with stunning scenery and great riding. After lunch it was time to head for Camp 1 at Lochranza. 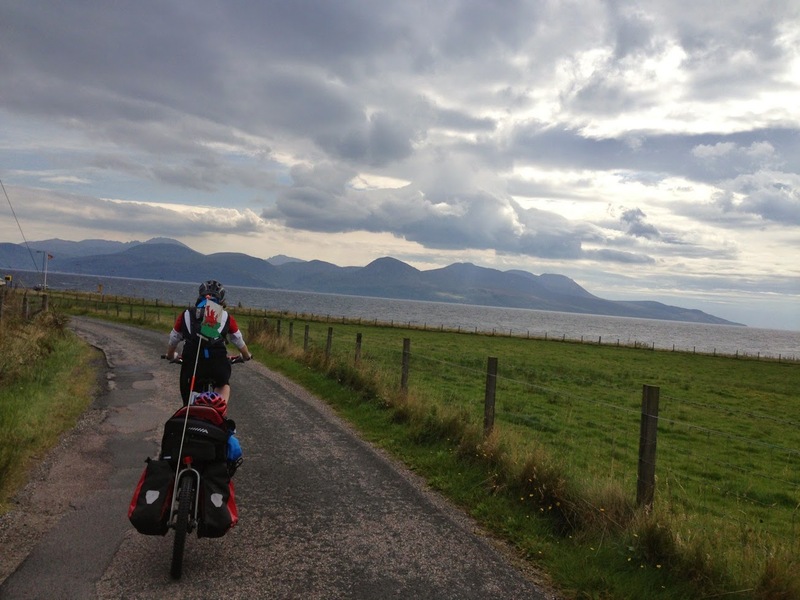 The riding along the coast of Arran was simply stunning. With all our kit the flatness was much appreciated! We arrived at Lochranza after about 30 miles of fantastic riding, weather and scenery. We headed for the campsite at the head of Lochranza passing the iconic Lochranza Castle. We headed to the Lochranza Hotel for a well deserved tea. We were also introduced to the 'camping game' which was certainly an experience!! Heading back to the campsite we were met by the deer that roam Lochranza showing very little concern for those around! In the morning the weather was still sunny and spirits were high as we headed for the ferry. We left Lochranza on the 9.30am ferry, just making it to head for the mainland and Claonaig. The ferry was very busy with cyclists and there was a comical moment when the back door was closing and H's trailer was on it as it was going up!! We watched on in horror until a nice Calmac man came to help! Arriving at Claonaig we headed the 5 or so miles over the pass to Kennacraig in time for the 13.00 ferry to Islay and Port Askaig. 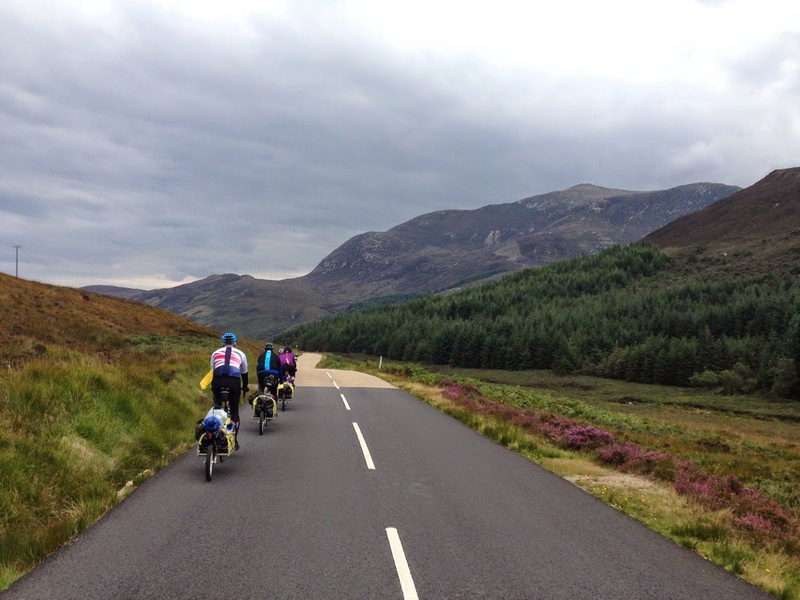 The riding over the pass was lovely with a steady climb and stunning views. Arriving at the ferry port we got the stove out for another brew before boarding and settling down for the crossing. We were due in Port Askaig at 14.55 so we had plenty of time to chill, admire the view and eat. The crossing was very pleasant with gorgeous views of Jura and Islay as we approached Port Askaig. The port itself is small but bustling with ferry traffic. Setting off we headed up the hill out of the port which was not what you needed without a warm up and weight on the bike! However once again the stunning views kept the mind off the burning legs. We headed for Bridgend as this is where we were to turn right towards our camp for the night at Port Charlotte. We only had 17 odd miles to camp so we took our time and took in the scenery even stopping for the odd walk on the beach. Arriving in Port Charlotte we headed through and out to find our campsite at the Port Mor centre for the night. 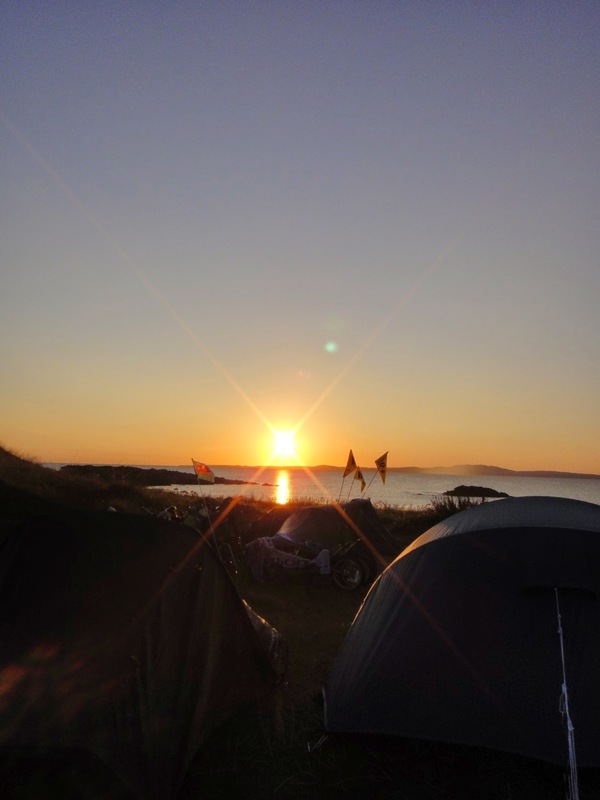 The campsite was stunning, overlooking Loch Indaal. The campsite had a cafe that was open until 8pm and also a fantastic play area! The showers and facilities were high quality and it really was a stunning place to stay! With the Wee man we ate in the cafe to ensure he went to bed in good time whereas the rest of the group ate at the Port Charlotte Hotel. Watching the light fade on the loch with a brew was very relaxing! Our morning brew tasted even better with the view across the loch. We took our time to pack up and headed for breakfast at the cafe before heading for an explore before Camp 3! The first destination was Loch Gruinart as it looked awesome on the map. However it was a nice ride but not the most stunning beach we had come across on the island! There are many distilleries on the island and each with their uniqueness! Heading back over to the main road we headed for lunch at Bowmore. The road to Bowmore is more undulating before the straightest road on the island! The route took us past the airport which has about 2 flights a day to the island. We soon arrived just outside Port Ellen. We booked a table at the Islay Hotel to ensure we could eat later that evening and headed for Camp 3 on the dunes at Kintra. 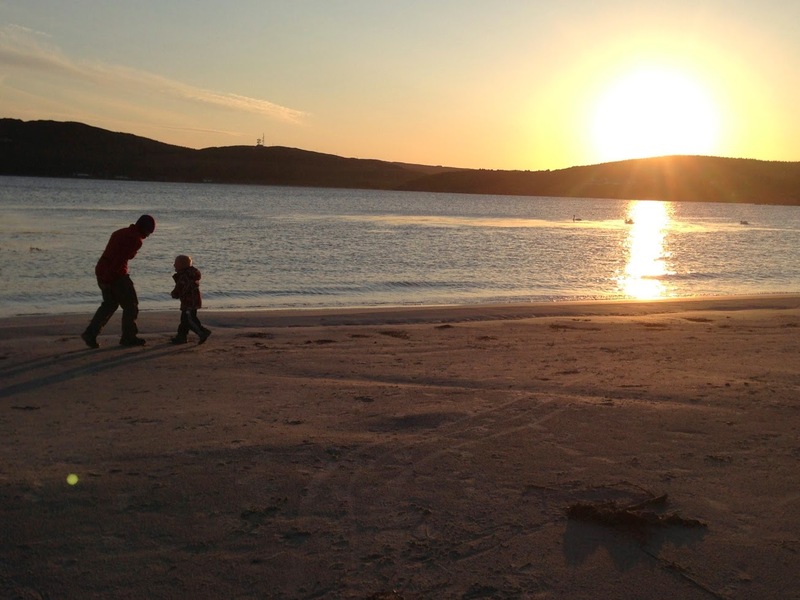 The campsite was about 4 miles out of Port Ellen so we booked a cab for our evening meal. Carols cabs were very accommodating and we had a lovely meal at the Islay Hotel. The food was fantastic and we even had time to walk along the beach and watch the evening ferry come in. As we arrived back at the campsite the sun was setting in true west coast fashion!! We were treated to a show of mother nature at her best! We sat for a few hours passing the evening away with many laughs whilst enjoying the stunning vista! During the night the wind picked up and didn't stop! We had a head wind from when we left the campsite to when we arrived at the ferry at Brodick! However we had still not experienced a drop of rain on the trip! 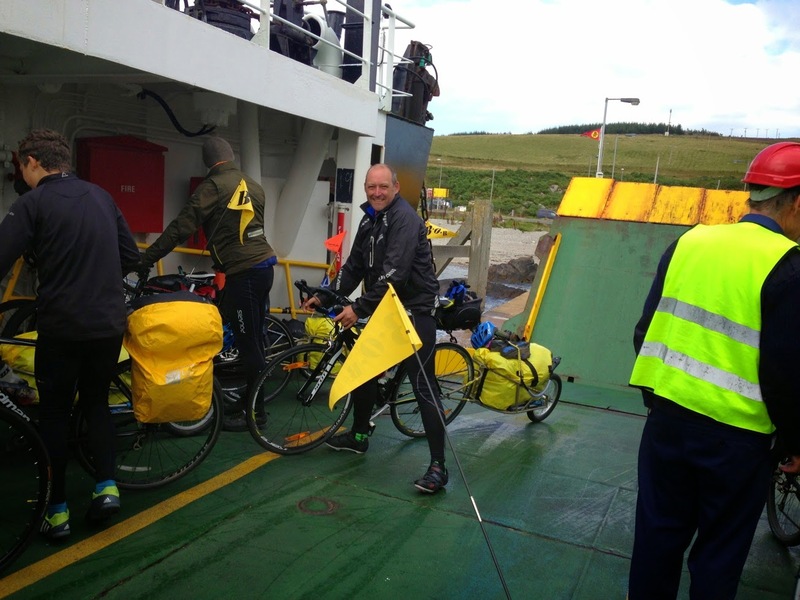 We caught the 9.45am ferry from Port Ellen along with many other cyclists! 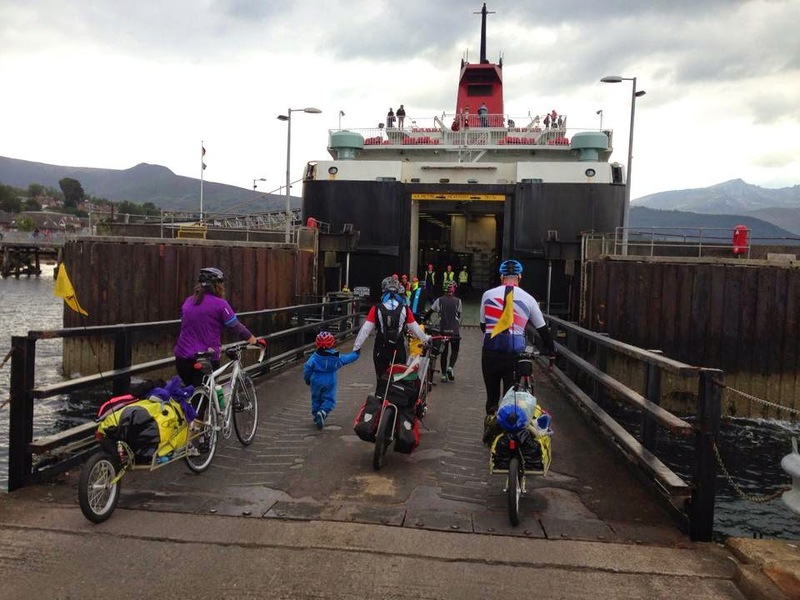 It was great to see so many cyclists on every ferry! The ride to the port was interesting into a direct head wind but we were all sad to be leaving the Isle of Islay! Arriving at Kennacraig just after 12 meant we had just over an hour to ride the pass and catch the ferry from Claonaig to Lochranza. Even though the pass had two 14% sections on it we negotiated it fine! 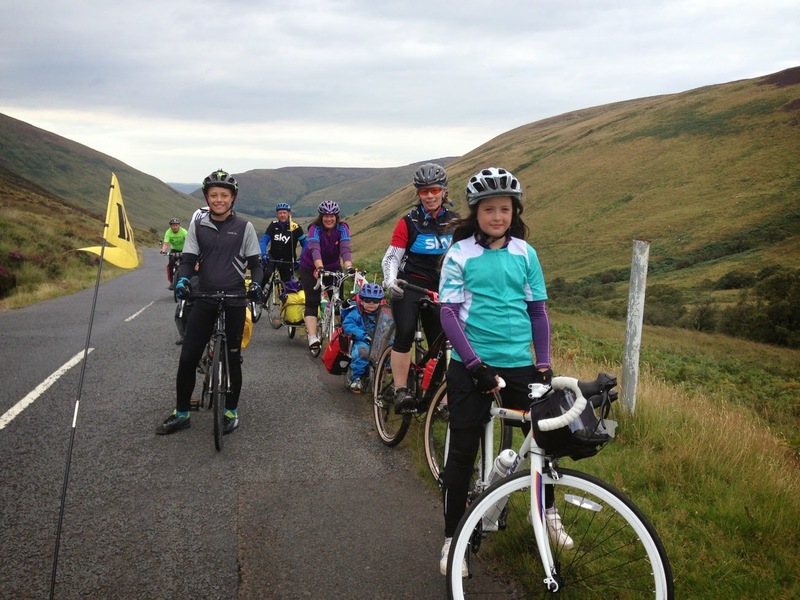 The legs were feeling weary as we approached the 100 mile mark for our trip but the descent helped down to the ferry. The sea was being battered by the wind and this made the embarkation of the ferry exciting as it bobbed violently side to side! Arriving in Lochranza we steadily made our way over the top down to Sannox. The headwind on the climb didn't dent our spirits as we played the alphabet game on the way up to keep our minds off our tiring legs! The ferry was leaving Brodick at 16.40 and by the time we had reached the top of the climb we had just about an hour to do over 10 miles with the trailers! This was much faster than our usual recreational speed! The descent down the glen was fantastic but with a headwind not as fast as it should have been! We reached the 7 mile mark with 40 minutes before the ferry set sail! It was now a serious time trial to get the ferry! The 11 year old took up the challenge and maintained an average of 15mph right up the the ferry gangway! We made it with 5 minutes to spare!! An awesome effort by all and amazing grit and determination shown by the younger members of our group! With sadness and relief we boarded the 16.40 ferry back to Ardrossan. The trip was one of the best with over 100 miles covered over the 4 days on 2 wheels. Great company, great scenery and great weather certainly helped!